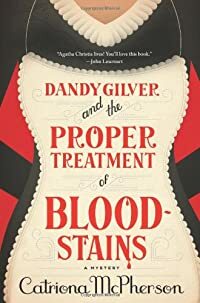 Dandy Gilver and the Proper Treatment of Bloodstains by Catriona McPherson, a Mysterious Review. Review: Socialite Dandelion Dahlia Leston Gilver — Dandy to family and friends — takes on the case of determining why a man would want to kill is wife in Dandy Gilver and the Proper Treatment of Bloodstains, the fifth mystery in this series by Catriona McPherson. Dear Mrs. Gilver, My husband is going to kill me, and I would rather he didn't.. So begins a letter to Dandy from one Walburga Balfour, who believes that her husband Philip — everyone calls him "Pip" — is having her every move watched, waiting for the perfect opportunity to do her in. She devises a plan to talk to Dandy about her problem by way of a previously scheduled day of interviews to hire a new maid. Dandy must, of course, appear in character and be prepared to be subjected to fierce scrutiny by the other members of her household staff. Intrigued, both by the case and the requirement that she play a "downstairs" role, she accepts the assignment. But it all goes awry, as these things are wont to do, when Pip is the one found murdered. There is definitely some appeal in the multi-faceted character of Dandy Gilver — she's familiar in a "just can't figure out who she reminds me of" kind of way; her ruse as a housemaid, to investigate threats against her client and the corresponding play on upstairs/downstairs attitudes; and the setting (time and place). And the murder mystery plot itself is well developed, in the style of a country manor whodunit with plenty of suspects and twists. But be prepared for what seems to be a very chatty, very wordy mystery. There probably aren't any more words in this novel than in the vast majority of its peers, yet there's an overriding sense of everyone prattling away, even the author in her often overly descriptive and detailed narrative. There's certainly some entertainment value in the frequently witty dialog, but it does tend to wear a bit thin, especially when the reader just wants Dandy to get on with it and solve the case. Acknowledgment: Minotaur Books provided a copy of Dandy Gilver and the Proper Treatment of Bloodstains for this review.